CT Website Redesign – get everything you dreamed of. 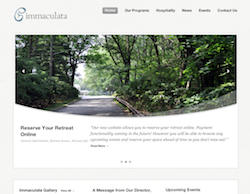 When Immaculata Retreat House approached us in February 2012 for a website redesign, they had only a few things in mind: A cleaner updated look and feel, painless and easily updatable pages that they could manage in-house, and better results in Google. We were able to accomodate this request without a problem. Their old website was using 5-7 year old technology, that was pretty painful to update internally. Free Consultation – We always start with a free consultation with you via email, telephone or in person if you are located in Connecticut. We get to know you and get to understanding your business to create the vision for your website. With the vision in mind, we evaluate the needs of hosting and website functionality requirements. We provide a quote and contract that suits your business needs and budget. Site Structure And Prototype – Once you approve the quote and sign the contract, we start working on the site structure and prototype. Once the design is approved, we will revise it according to your specifications. We offer a wide array of payment options to suit your business needs and budget. Building your Website – Next, we will develop your site according to the prototype design you have approved. This is also the stage where we need the content for the web pages, graphics or videos for your website, and other material that will go into your website design. We would advise you to have all the material as electronic files because anything that needs to be typed or scanned will be charged extra. We keep Google in mind as all of our sites come standardized with basic feeds to all the major search engines. Website Launch – After we finish constructing your website, we ask you for the final approval so your site can go live. Before the launch, we would test the website design with different browsers to make sure it is compatible with all browsers that are used on the market. Ongoing Website Maintenance – After the launch, we can maintain your website for a small fee. If you are interested in internet marketing, we would start our search engine optimization and search engine marketing efforts. Here the final product for Immaculata Retreat House. Contact us if you are seeking results on the web today!